Wedding season is quickly closing in on us, so we approached Saskia Scott, owner of Sweet Revenge Bake Shop, to help our readers out with some wedding cake trends happening in 2014. Saskia believes the trends for 2014 include luster, glam, rustic & vintage inspired creations. Painted cakes are beginning to rise in popularity and Sweet Revenge receives requests for everything from flowers to skylines. Over the last couple years, cupcakes were popular and started replacing the traditional cake at celebrations and Saskia feels they will still be around for 2014. 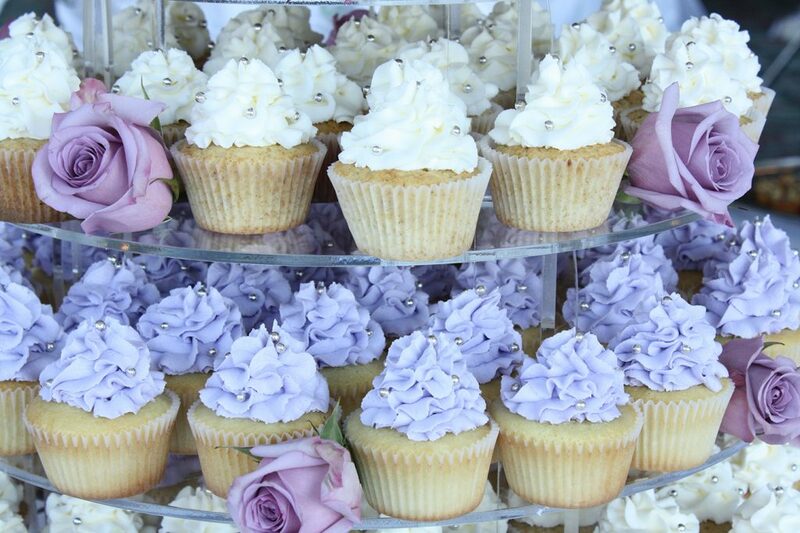 Saskia says many couples are still choosing to serve cupcakes at their weddings because they are individual, can appeal to several different tastes and don’t induce a cake cutting fee. “Cupcakes allow you to have a variety of flavours, frosting and filling combinations,” she explains. Sweet Revenge, for instance, offers couples the ability to cater to their vegan and gluten free guests with this option. Initially cupcakes became popular because they were cheaper than a tiered cake, but as the trend took off, designs became more intricate and time consuming to make. Depending on how detailed you want your cupcakes decorated (such as monogrammed fondant circle initials and delicate sugar roses), Saskia suggests couples do their homework and see if the price of individual cupcakes fits in better with their budget. Cakes often win over couples in the tradition department. Many brides have a hard time letting go to the long standing tradition of cutting the cake. When the bride and groom cut the cake together it symbolizes their first joint task in married life. The gesture of feeding cake to one another is a symbol of the commitment that the bride and groom are making to provide for one another. Saskia recommends that couples book at least three months in advance, this way they can secure their date with a deposit. A bakery can only comfortably handle so many cakes on one particular day. Colour schemes for this year tend to fall into the pastel romantic category. They include soft vintage colours, as well as purples, creams, greys and Tiffany blue. This season Saskia has been receiving several requests for blush pink and gold designs. Select a style: Have an idea of what you want before you come in. When she sits down with a bride and groom, it is always best that descriptions, ideas and desires on the part of the couple are explained in detail. Deal with the cake after all decisions about dress style and reception decor have been made. Bring things in with you such as pictures, swatches of fabric and even your invitations. 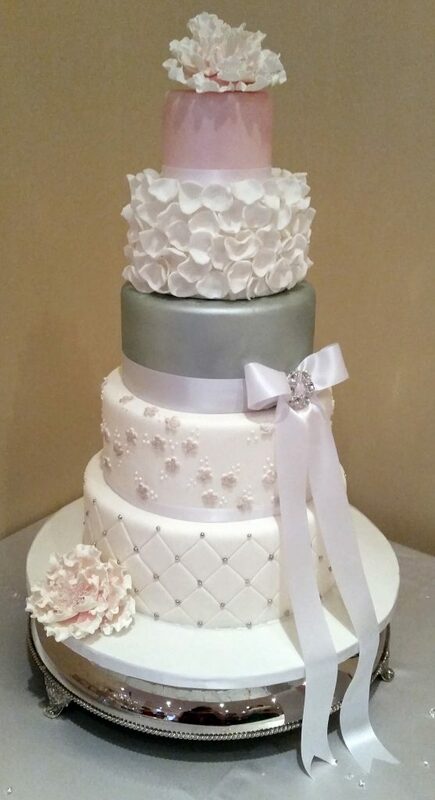 Elements such as these serve as a layout for the design and structure of your unique wedding cake. Be sure to choose a cake that is compatible with the style of your venue, the season, the bride’s gown and the flower arrangements. Since your cake serves as a centrepiece for the reception, we want to make sure that yours represents your wedding from the inside out. Overall, your cake should fit in with the theme of your wedding. Decide how many guests you want your cake to feed: It is important to know how many guests you will have in attendance at your wedding as well as whether or not you will have a sweet table or plated dessert in addition to the cake. These factors will allow us to help you determine an appropriate size for your wedding cake. You get what you pay for: Don’t be afraid to say your budget. It really is important that you trust your baker enough to say your actual budget. Letting them know this in advance means that they can work on ideas that are actually realistic. There are many ways for you to get the cake of your dreams and still stay within your budget. “There is a saying in the business that cheap cake isn’t good and good cake isn’t cheap,” Saskia says. “This doesn’t mean that we can’t work with budgets of all sizes.” Being flexible with your designs and ingredients is key. Trust the professionals to take care of your wedding cake: Make sure the person you order your cake from is reliable. It is important to meet with your baker and fully understand the range of their abilities. In order to get exactly what you want you have to hire a person who is going to give you the quality that you desire. Do your research. Once you have a sense of cost and a rough idea of the type and style of cake you are looking for, meet with your baker in person to look at their portfolios. If you like what you see, ask to sample a few varieties they may have on hand. At Sweet Revenge, they have their top three flavours available every day in cupcake form. Make sure you like the flavour of the cake before you commit to it. Don’t forget about the groom’s cake: The popularity of the groom’s cake is on the rise. While the wedding cake is traditionally eaten as a dessert, the groom’s cake is usually darker and richer and is usually sliced and given to guests as a take home memento. This cake is where creativity can come into play. While the wedding cake is formal, the groom’s cake is all fun. Groom’s cakes are crafted to show off the groom’s passions such as his favourite sport, team or hobby. Sweet Revenge Bake Shop is giving couples the chance to win their wedding cake. To enter, brides need only book an appointment to meet with Saskia and her group for a wedding quote. There will be one grand prize winner who will win their wedding cake for free! The contest runs until July 31, 2014.